Meet the Quimby’s. 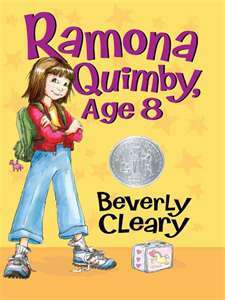 In Ramona Quimby, Age 8, Mrs. Cleary details for us this ideal American family. The Quimby’s aren’t perfect, and they can hardly make ends meet, but they tolerate each other’s idiosyncrasies with love and understanding. A generation of kids grew up feeling a part of Ramona’s world, and it’s still a safe, happy place for kids to enter today. Another time, she’s introduced to “Bruce who doesn’t wee-wee in the sandbox”. While adults are appalled at such an introduction, “Ramona was not shocked. She understood that there must be a second Bruce at Willa Jean’s nursery school, a Bruce who did wee-wee in the sandbox.” So logical. So funny! But every child can relate. Then there are the fears and emotions readers will also identify with. Ramona, after smashing egg into her hair by accident, overhears her teacher tell the school secretary that she’s a showoff and a nuisance. Or at least that’s how Ramona understands it. So she spends much of the school year trying hard not to be a nuisance, only to throw up in school. Then her mother must miss work to care for her, and Ramona realizes she is a nuisance. But that’s okay, she learns, because she didn’t mean it. And her parents love her anyway. And that is what makes the Quimby’s so attractive. “Ramona snuggled inside her car coat, feeling cozy enclosed in the car with the heater breathing warm air on her nice family. She was a member of a nice sticking-together family…” A family that stands out. A family that welcomes a reader in. A family readers can admire and emulate. Read more of my Beverly Cleary reviews.